What’s this? What’s this!? In all the world, there is no greater lover of the thinning of the veil, the mysterious happenings, and spooky tidings of All Hallow’s Eve as the Pumpkin King, Jack Skellington. As the patron saint of Halloween, the living skeleton can remove parts of his very body, usually to only comedic effect rather than harm. While lacking the more conventional magic of Santa, locked away in his own wintery holiday, the oddly friendly skeleton’s powers are an intriguing set of spooky tricks that ensure each year the world’s population find joy in their terror. The problem is being locked up in a single holiday. What about the other seasons? Or, even, what about Halloween parties that take place on the 30th!? What, can the master of Halloween fun not go to a one-day-early Halloween party? The sad limitations of spirits of All Hallows Eve has been a trying obstacle that we’ve been opposing for years and we finally have the means to break through that barrier and allow the spirits to galavant with the rest of us at their whim. 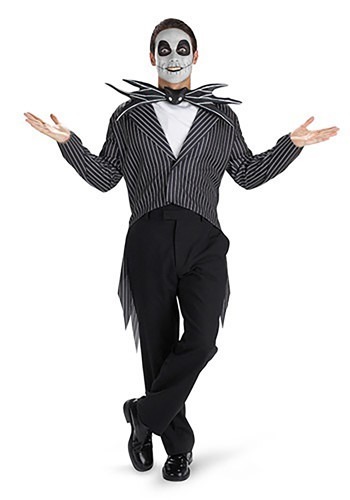 So, you can now be the mighty Pumpkin King at your leisure with this Men’s Jack Skellington costume from the classic Tim Burton movie, Nightmare Before Christmas. The polyester interlock knit jacket is white and black pinstriped with a cutaway tail and exaggerated, wide lapels. An oversized vinyl bow tie has an inner wire to help maintain its bat-like shape. All you need now are a few excited tykes or a ghostly hound to accompany you on your mortal world adventures!